There are few things in this world I love more than a Duggar wedding, and it seems like those are now officially behind us for now. TLC's 19 Kids and Counting is marrying off the Duggar daughters one at a time, and although Jill and Jessa have tied the knot in recent months, oldest daughter Jana is still waiting in the wings — and that's totally fine by me. Girl, you do you. But according to what the rumor mill is churning out, that might actually be about to change... and in a ridiculously high profile way. 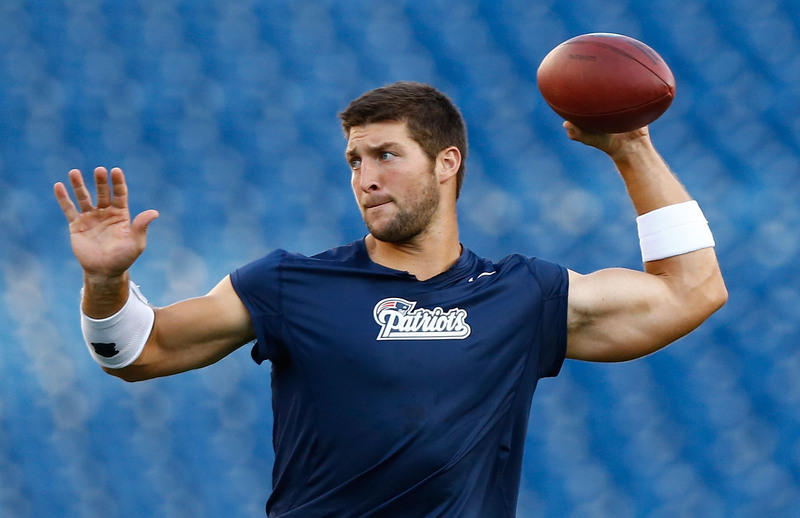 Get ready for this, y'all: Jana may or may not be courting Tim Tebow. I know you're inclined to laugh, but I'm serious. This is actually a thing that might be happening. And as someone who lives and breathes the Duggar family (for their flawless hair, not their religious and political beliefs), I've gotta say that this news is making me super excited. If you feel the same way, though, we should probably try not to get our hopes up. At this point, it's still a rumor, and reps for the Duggars and Tebow have neither confirmed nor denied that this is actually going on. That just means we have to figure it out for ourselves, though. Let's discuss. Jana Duggar and Tim Tebow: True or false? There's a very obvious clue here that we do not want to miss: Jim Bob and Michelle were recently seen canoodling with Tebow's mom, Pam Tebow. Remember, in Duggarland, the parents do all the bidding for their daughters so as to protect them from broken hearts (like that's even possible), so a line of communication would have to be open between the parents, and it definitely is. Also, would it or would it not be typical Jim Bob to want his daughter dating someone famous? As much as I love his children, I cannot stand Jim Bob. He is obviously money and fame hungry, and what would keep 19 Kids and Counting running longer than a wedding special featuring one of the most famous football players in the league right now? And then, of course, the Jana and Tebow-themed spinoff. This way, Jim Bob gets to keep his celebrity status, his giant aluminum prison (I mean, house) and that comfy spot on the moral pedestal he's put himself on. And as far as Jana's concerned? She'd be a great wife for an NFL player to have. She wouldn't be unfaithful when he traveled with his team, and she's used to being on camera, so she would be perfect to bring along to public appearances. She's also, I fear, used to wrangling large numbers of children by herself, so if Dad isn't home, Mom can definitely handle the troops. I've been expecting courtship news from Jana for awhile, so this wouldn't surprise me too much if it were true. Guys, this rumor is really crazy. Like. Super crazy. On that basis alone, I hesitate to fully believe in it until I've heard from an actual Duggar on the matter. Being that the men Jim Bob and Michelle have helped select for their daughters thus far have been very simple dudes who aren't used to being in the spotlight, Tebow just doesn't fit the pattern. I guess it just depends on exactly how power starved Jim Bob is — does he want someone more famous than his family to make him look good, or does he want someone who's a total nobody so that he keeps the upper hand? If Jana doesn't like her family's lifestyle and wanted to make an escape, Tebow would certainly have the means to make that happen — unlike Jill and her husband, Derick Dillard, who still live on property owned by Jim Bob. Jana's never struck me as the type of gal who would go for someone super famous, though. She herself is very low key, and I imagine she'd want to live her married life that way, too. Tebow's obviously good looking, he seems like a nice enough guy, and his religious beliefs line up with hers — so maybe that was enough to change her mind? Fingers crossed an official word either way is given ASAP. If Jana and Tebow are dating, I hope every minute of it is being captured on the TLC cameras, because it will be amazing.